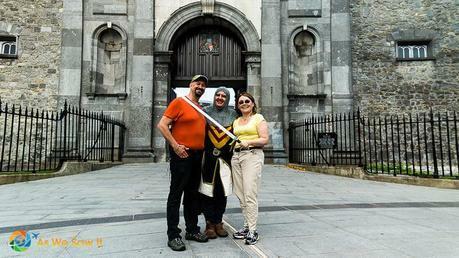 What if you only had a day in Kilkenny and a local offered to show you around? 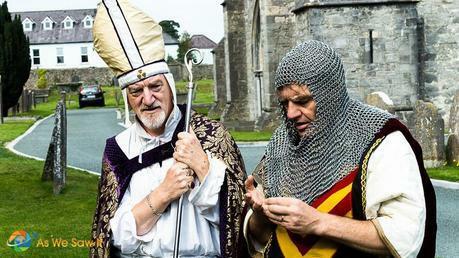 We had the unique opportunity to be guests of Failte Ireland (Ireland’s tourist bureau) and Kilkenny Tourism. They showed us seven things to do in Kilkenny we might not have tried otherwise. 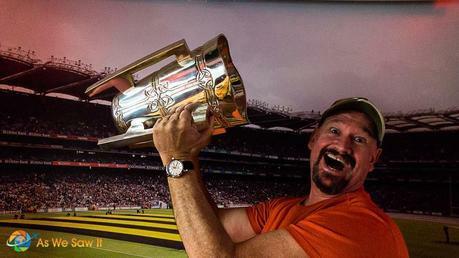 Perhaps you’re wondering why hurling is on a one-day tour of Kilkenny. You might even be wondering what hurling is … is it what college students do after returning from the bar on a Saturday night or something? No, it’s a 3,000-year-old sport that’s only just now catching on in the U.S. Forget soccer or football; the Irish are rabidly passionate about the sport. Hurling has been played in Ireland for over three millennia and is arguably the world’s fastest game … and Kilkenny has the best team in the country. 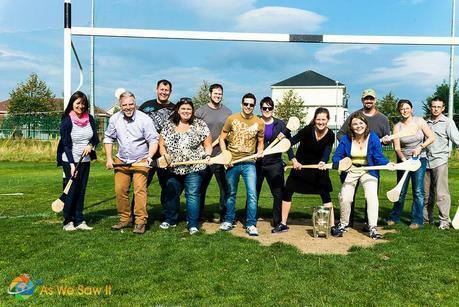 Only one day after the All Ireland Hurling Final, we got our own chance to try our hand at it, courtesy of The Kilkenny Way Ultimate Hurling Experience. Our host, P.J. Lanigan, met us on a hurling field and gave a brief talk about the sport, its history, and why it’s so popular. Then the fun began. He had us each pick up a hurley (the stick) and hurling ball, and before we knew it we were blocking, hooking, lifting and striking, skills I’d never known of before. By the end of it all he had us balancing balls on our hurleys and running across the field. Even for someone like me who is not a sports fan – and most definitely not athletic – this is a fun way to spend two hours. With all that running around you’ll be hungry, I promise. 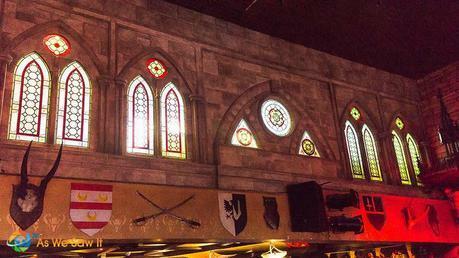 The hurling experience ends up at Lanigan’s Legends Hurling Bar, the sports bar for hurling enthusiasts. He escorted us to the upstairs bar, which he had turned into a hurling museum, complete with hand-painted murals of history’s greatest hurlers and a well-thought out assortment of hurling memorabilia. Plus, there’s a TV on the wall, so if there’s a game on you can watch them use the skills you’d just learned while you eat. 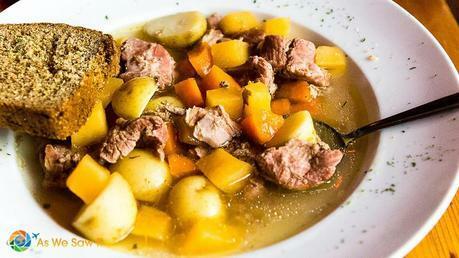 We enjoyed a savory bowl of very traditional Irish lamb stew there. Plus – since it comes from Kilkenny – Dan and I also ordered a pint of Smithwicks, a nationally popular red beer. 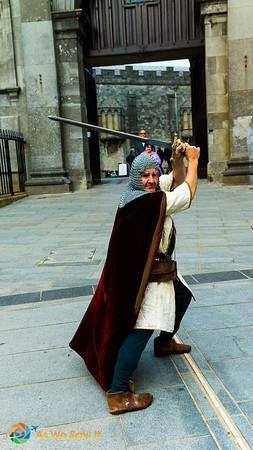 Our tour was led by “Sir Mike,” the Sovereign of Kilkenny, who claimed to be from the time of the Black Death. He took us along the city’s ancient streets while he told stories of people from his past and showed us the buildings, alleys and streets of his time. Sir Mike had a great sense of humor and made the city’s history come alive. We met a few characters along the way. At John Rothe house, the wealthy merchant took us around the house and gardens he had built in the 1600s. The bishop of Black Abbey Church showed up to discuss finding Dame Alice Kyteler. Sir Mike led us into the inn to “meet” Alice and hear her tell about her life. 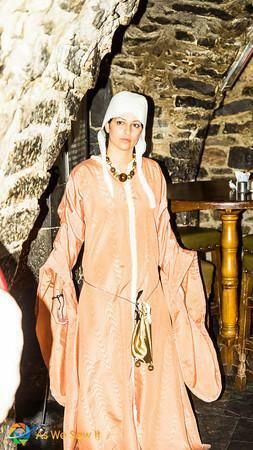 Alice de Kyteler began Kyteler’s Inn in 1263. As the daughter of a Norman banker, the owner of an inn and the wife of four husbands in succession, she became very well-to-do and very well-connected to the local gentry. Thank God for those connections. Jealousy over her success led Alice to be eventually accused of having used witchcraft to kill her husbands and sentenced to be burned. Her friends, the local gentry, ensured that she was ‘spirited’ away to England before she could be arrested. Kyteler’s history is fascinating, but so is its layout. Everywhere I looked I seemed to find another room. When I finally arrived at the top level I discovered a huge room with wonderful windows overhead. Kilkenny has its own castle, built in 1195 to control an important fording point on the river that runs through the center of town. It was privately owned until 1936, when it was sold to the government. You can walk around the grounds or pay a fee and tour the castle’s interior. Two wings have been restored to what they might have looked like in the 1800s. I’d have liked to share a few photos and write more to inspire you to visit … but since no photography was allowed inside I’m not going to say any more. 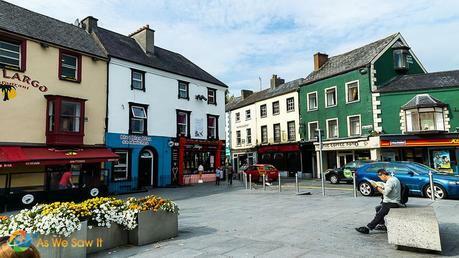 If you only have time for one day to see Kilkenny, then you must plan to visit on a Monday or Tuesday. One each of those two evenings Damien Walsh, a master Bodhran performer, gives group lessons in how to play the bodhran, Ireland’s traditional drum. Believe me, you don’t want to miss this. 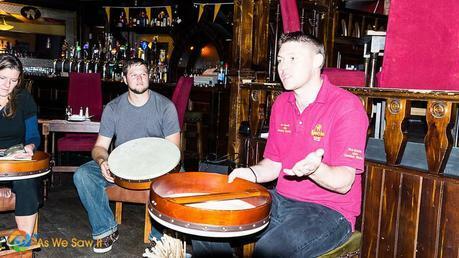 What better way to learn to play the ancient drum than at ye olde Kyteler’s Inn? 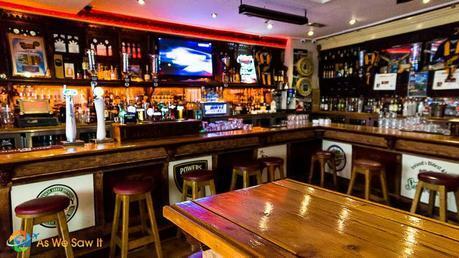 Here the historic bar’s ambiance and traditional drum’s rhythm will complement each other so well that you may lose yourself in the experience. Damien made everything so simple. Even though it’s so much fun just watching people try to learn to play the bodhran, it’s all the more fun to try it yourself. Even if you have very little musical ability and even less rhythm, you’ll end up feeling like a talented musician by the end of the class. 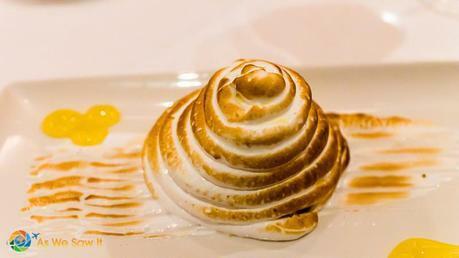 We usually look for inexpensive local hangouts when we travel so we rarely have the opportunity to dine at a Michelin rated place like Zuni Restaurant. What a treat! 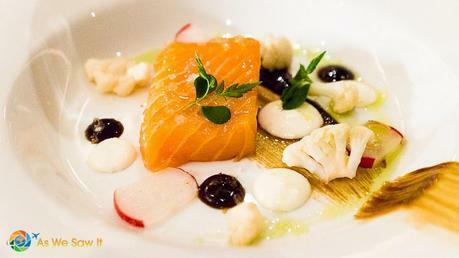 The chef, Maria Raftery, only uses the best locally-sourced ingredients, and she even designed her menu so that it reflects where each ingredient came from. The best way I can describe their cuisine is Irish-global fusion; the foods are native to Ireland yet the flavors and tastes are from all over the globe. As guests of the restaurant we had a menu planned and prepared to showcase their specialties. And yet when they discovered that some of us had special diets, they seamlessly adjusted the menu for us. 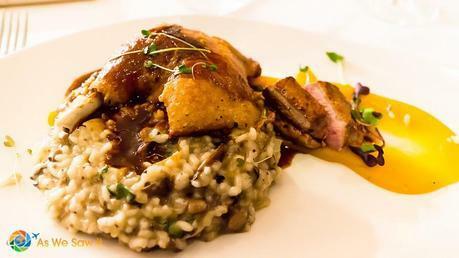 My mouth still waters when I remember that duck with mushroom risotto…. We were invited to stay at a luxurious hotel-spa-convention center just outside of town, a classic estate house with a very modern wing that somehow fit together in decor. While we were there Dan took so many great shots that it deserved its own post. Read about our stay at Lyrath Estate Hotel. For additional things to see and do in the area, the Kilkenny Tourism website is your best resource. Also please check out our gallery for more of Dan’s favorite photos of Kilkenny. Which of these things would you enjoy?